I shook my head from side to side, while sitting with my eyes closed. Pressing my lips together, rolling the decision over in my mind, I pondered. I pondered the melody of the song that was playing about as much as the words Billie sang this evening. But, oh, how I loved the mischief in her voice. You could hear the playful smile accompanying her tones; the tilt of her head; the teasing curl in the corners of her eyes. I knew this was an evening for mischief. 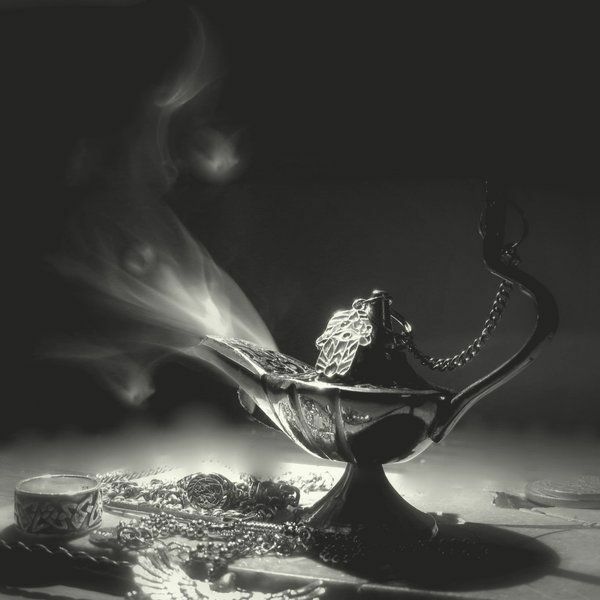 The genie shook my hand with a grin tramping up his white sleeve. With a simple gesture, he raised his hands in the air and made my wish come true. The air crackled with electricity and mysticism. I waved my hands in front of my eyes to clear the air. Coughing into the disappearing smoke, my eyes swam further down to catch a glimpse of the wish that lay on the floor. The wish was a nice and tidy, lego-blocked structure that resembled a symmetrical brick house of big faces – in other words, dead presidents. I thought to myself, hmmm…something for nothing. I greedily grinned from ear to ear dreaming on what I was going to do with all the money. What to do with it all? I stretched my arms out and spun in a circle. My smile widened even more. Umm, what to do with it all! I walked toward the shop window. The streets were crowded. The day was partially cloudy, yet still sunny as it shown on the hustle and bustle of each individual. The world outside was populated by sepia toned overcoats, pumps, and hard bottom shoes that were lightly brushed by the strides of wool and cotton fabrics. I could hear the voices, coming from those laughing and mocking faces, telling me I’d never amount to anything. All the haters who claimed to be in my corner, but tirelessly knocked me down at every turn for trying to make it my own way; be my own man. My eyes trailed away from the window as I thought about their condescending expressions. Well, I would show them now; Show them all that I am somebody; That Khalil Jones has value. But what should I do first with all of the money? I’d spent most of my life figuratively chasing the car without putting much thought into what I would do once I caught it. I thought to myself, maybe I’ll go out and buy one of those fancy cars, with the convertible top, like the Ballers on TV. I needed something to say, Hey, I’m not just a regular joe. I had always been thirsty for that life. I looked down at my shoes and sleeves and realized I’d have to swap these out first. My grandma used to say, ‘a woman can size up a man’s worth by his shoes.’ Well, I told myself, I’m gonna be a pretty important guy now. I need to look the part. The genie smiled back. “You’re very welcome, Mr. Jones.” While I stood there watching him smile, alarm bells rang inside my head. It was…like an instinctual, spidey-sense type of warning. There would be a price to pay. The genie had been somewhat clear about that, actually very clear. It’s hard to forget how he laughed after delivering that message. His laugh was goonish. The kind of laugh that’s confusing to react to. You end up reticently laughing along because it feels like there’s danger in not laughing. So, I laughed along as I wiped the sweat from my upper lip. Yet and still, I simply failed to fully understand the gravity of the terms and conditions of his contract. “Aaagh! Sure.” I’d waved my hand in the air, dismissive of the notion of consequences. They were just consequences. Any potential consequences were nothing more, in my mind, than the equivalent of a coin toss. How harmful could a coin toss be? Tipping his white fedora forward, he lifted his cane from the floor while firmly grasping it in hand. “I will return when you are ready to make your next wish…master. In the meantime and in between time, enjoy!” He bowed his head and let loose his goonish grin again, sending a fresh wave of uneasiness to wash over me. The gesture had a certain sense of phoniness about it, as well. He was no more my servant or at my request, than he pretended to be. And such is the issue with those who respond to kites floated on whispers and bent knee in the late hours of the night; they are beholden to no one and serve their own interests. All of a sudden, the horns jumped alive and out of the creases of the record with an arm swinging and leg kicking jaunt of a chorus. “Yeah, yeah sure!” I replied to the genie while steadfastly keeping my eyes fixed on the money. The genie stopped mid-stride, before reaching the door. He pointed his index finger up to signify the delivery of some important information. “Oh, before I go! I’ll need you to sign for the shares of stock options you just sold.” This seemingly random and momentary lapse in thought on the genie’s behalf, lacked all familiar cues of an unrehearsed and reactive response. “Stock options?” I looked at him quizzically. Thanks Tareau for the bounce back and the time! This definitely leaves me wanting more. Another great visual piece!